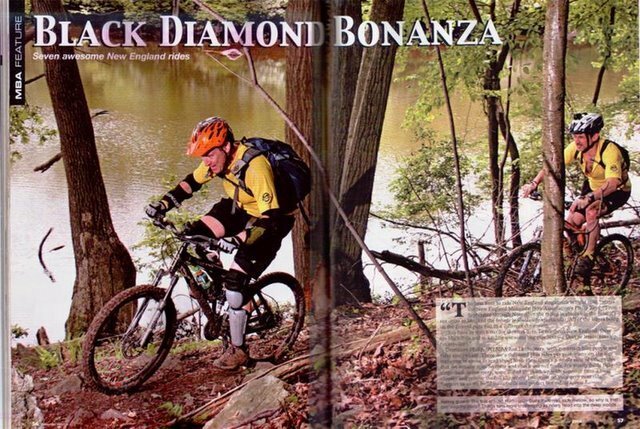 Here I am featured in the October 2006 edition of the Mountain Bike Action. 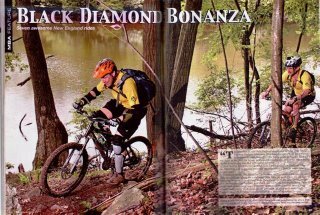 It's kind of ironic that the article is about riding in New England, specifically difficult riding in New England which is kind of like skiing in New England, in that if you can ski here you can ski anywhere. Of course the irony is that where this picture is taken, most of the trails are from being difficult. The Ed (the guy behind me) are on is called the Rock and Roll Trail at Huntington State Park and it was designed and developed by Paula Burton who is a CT NEMBA chapter president and from the area. On top of that, though, I am wearing all my armor which may tell the reader that this area is actually tougher than it looks but I am doing so because I like to try anything, drops, rollers, log rides, and while I might not do them as expertly as others and often fall off them, the armor at least keeps me from getting bloody. Even the write up on Huntington is kind of out of porportion with the article. If the editor was a little more forthcoming in the gist of the article maybe we could have gone somewhere in the state that is more fitting to article, like Middlesex.